Ukraine's president has said the Minsk peace roadmap – recognized by international powers as the only way out to the conflict in Donbass - is a "pseudo-peace", for which Ukraine is paying too high a price. "We will fight to the last drop of blood," Petro Poroshenko said in an interview to the German TV channel ZDF. He said his forces would do so to protect the eastern Ukrainian city of Mariupol from "Russian aggressors." Poroshenko has been accusing Russia of invading his country since the start of the conflict by supporting rebel forces of the self-proclaimed Donetsk and Lugansk People's Republics. The claims are echoed by the US and other NATO powers, but to date no solid proof has been provided. Moscow denies the accusations. In the same interview to ZDF, Poroshenko said the Minsk agreements, brokered by international powers, were a "pseudo-peace." The Minsk deals are seen by every major nation, including Russia and NATO countries, as the only way to peace in Ukraine, with diplomats urging all sides in the conflict to adhere to all the deal’s points. Poroshenko himself earlier said he honored the Minsk deal. In fact, in the ZDF interview, he said he remained committed and saw no military solution to the conflict - despite his own earlier words about fighting to the last. The Ukrainian president said his country was paying "too high a price" for adhering to the Minsk deals, saying 83 soldiers have died since the turning point talks in February. During the interview, Poroshenko also disowned his earlier statement, in which he vowed to free Donetsk Airport. "I advise you not to read Russian newspapers. They are the only source where you can find such nonsense," he told ZDF. The statement he made just three days before that is actually transcribed on his official website and reads: "I have no doubt - we will free the airport, because it is our land. And we will rebuild the airport." It was made after the first showing of a documentary dedicated to Donetsk Airport and the eight-month-long siege it endured before falling into the hands of anti-government forces. That statement drew reaction from both Moscow and Washington. The Kremlin spokesman said it "clearly violated the Minsk agreements," adding that Kiev repeatedly breached the deals before. US Secretary of State John Kerry advised Poroshenko to "think twice" before doing anything that could reignite the hostilities in Ukraine. Author and Russia analyst Martin McCauley told RT the Ukrainian president is trying to antagonize Russia so that the West keeps supporting him despite the recent statements by US Secretary of State John Kerry. McCauley said: "Poroshenko] has got to wind up the conflict and present it as one that is escalating so the sanctions will continue, the United States will continue to support Ukraine and so on. He is the one who is trying to tell Kerry and [German Chancellor] Merkel: the situation is much more difficult than you think it is." At Tuesday's meeting with his Russian counterpart in Sochi, Kerry said sanctions the US and the EU had imposed on Russia over the Ukrainian crisis would be lifted if the Minsk deals are observed. Canadian political scientist Brad Cabano told RT's Anissa Naouai that Poroshenko could be antagonizing Russia for political gain: "Everyone has to have an enemy, and I think in this case Mr Poroshenko, for his own political purposes, probably to rally people in the western Ukraine, has decided to target Russia as the bad guy. It's a very simplistic way of looking at things, but what's even more simplistic is to expect the several million people that live in Lugansk and Donetsk to accept being placed under the rule of a country that's killed and maimed tens of thousands of their people. 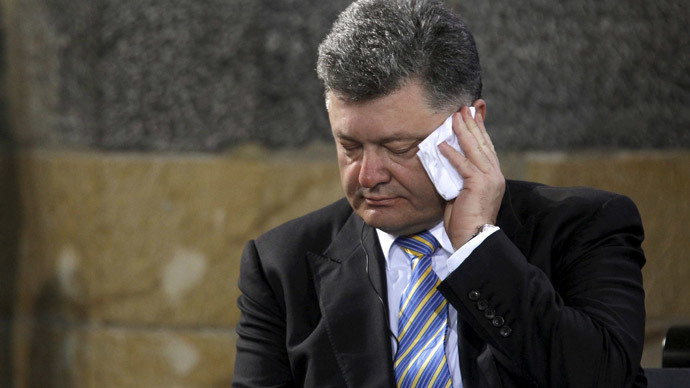 It's a situation that's almost a 'mission impossible' for Mr Poroshenko."